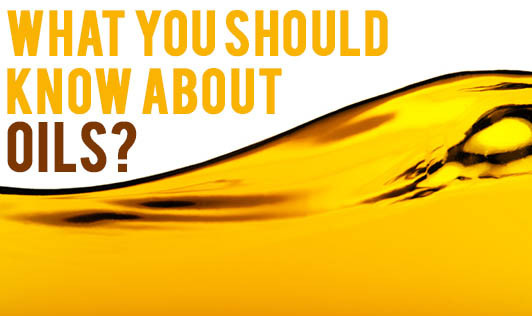 What You Should Know About Oils? Fats or oils are good sources of energy to the body. They contain several other important functions as well. Fats and oils contain different components in them and each of them carries different properties and functions. Many oils today are also fortified with fat soluble vitamins like A, D, E and K that help meet the nutrient requirements of our body. 1.Saturated fats: Saturated fats are a group of fatty acids that can raise blood cholesterol levels. Saturated fats are found in tropical oils like coconut or palm kernel oil. When margarine or vegetable shortening is made from corn oil, soybean oil or other vegetable oils, hydrogen atoms are added making some of the fat molecules "saturated". This also makes the fat solid at room temperature. 2.Unsaturated fats: Unsaturated fats are liquids at room temperature. Most vegetable oils contain unsaturated fats. The two types of unsaturated fats include "polyunsaturated" and "monounsaturated" fats. All foods have these fats in varying proportions. 3.Cholesterol: Cholesterol is an essential fat made by the liver of animals. Vegetable oils do not have any cholesterol in them. But, intake of vegetable oil in quantities more than required will result in an increase in cholesterol levels. 4.Trans fats: These are produced when liquid oil is made into a solid fat by a process called hydrogenation. Trans fats are like saturated fats. They can raise your cholesterol levels in the body. If you want to avoid as much Trans fat as possible, you must read the ingredient list on food labels. Trans fats are listed on the label, making it easier to identify these foods. Look for words like hydrogenated oil or partially hydrogenated oil as well. It is better to select foods that either do not contain hydrogenated oil or have liquid oil in the ingredient list. Be smart while selecting your oil!